Following the publication of this web site a number of former Kingswear residents have written. Malcolm Hall was a refugee in Kingswear during the war and has written an account of his stay. To read it please click here. Peter Watts is now living in Hervey Bay, 400 kilometres north of Brisbane, Australia with May Watts (neé May Crisp). Peter's sister in law Hilary Ackerell lives one kilometre away from him. Peter tells me that he regularly sees Elaine Payne (neé Elaine Burrows). Elaine lived in Kingswear for all of her life until she married Ernie Payne (from Dartmouth) and shortly after their marriage (over 20 years ago) they emigrated to Australia and presently live in Victoria, South Australia. Wow fancy Kingswear school having its own web site. I attended there from approx 1943-1945, under the tuition of Miss Haywood. Lived at the Steam Packet Inn, Fore St. during and immediately after the war. Living now and for the last 30 years in Sydney, Australia. If anyone can remember me please drop me a line. (E-mail Address: gentleman_jim34@yahoo.com.au ). 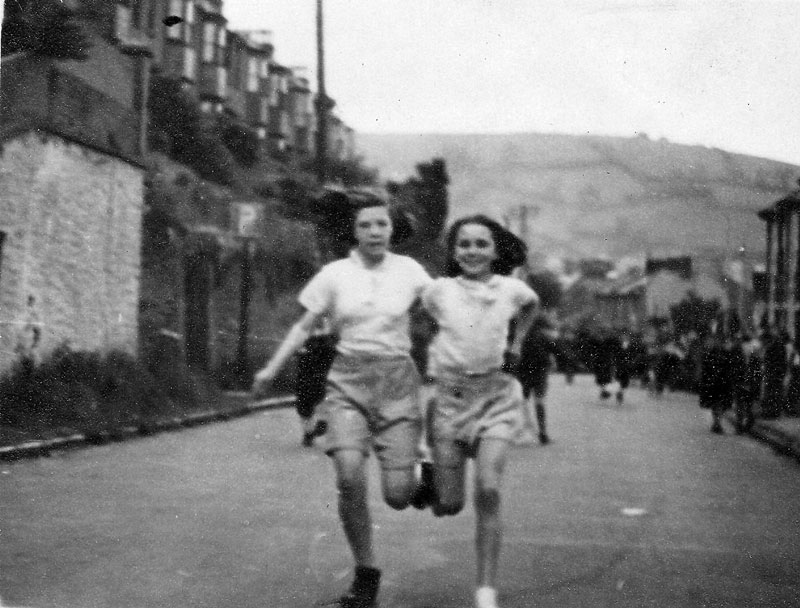 I looked very hard at the picture with the 2 girls winning the four legged race on VE day because I was there too, and afterwards we all went over to the bandstand at Newcomen Park, Dartmouth. grand mother Mrs Gunning or my aunt Mrs Bovey. 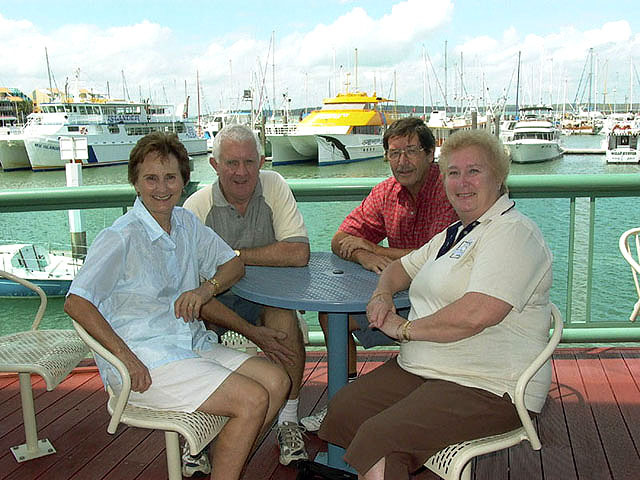 contact with Peter and May Watts in Hervey Bay. very strange living in someone else's house. to be more hectic when all that gets going. 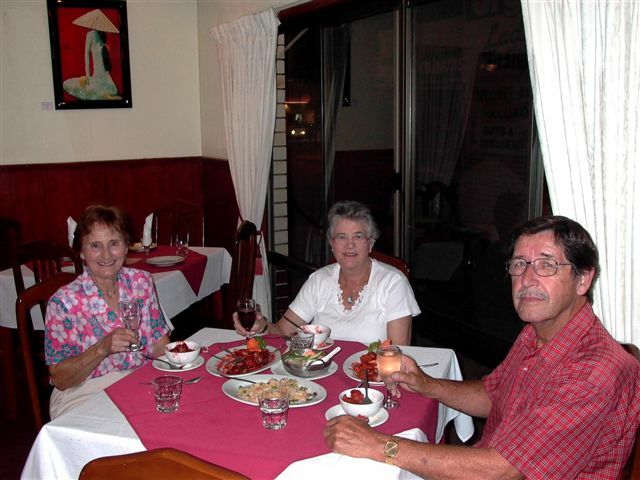 Pauline Tetther dining with May and Peter Watts at Hervey Bay (see above). We have new contacts in Australia. and would be pleased to hear from anyone who used to know them. They are picture here visiting Peter and May Watts. Sadly Peter died September 2015.